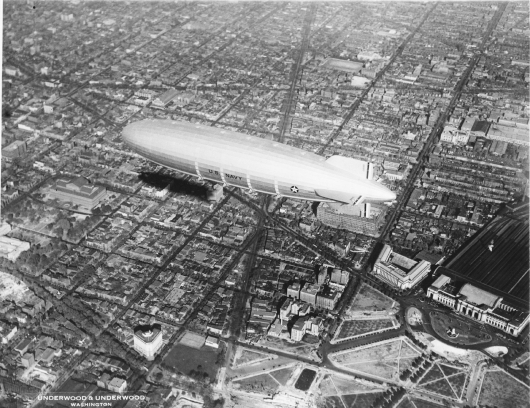 The Akron was 785 feet long, about 20 feet shorter than the Hindenburg. Construction was by the Goodyear-Zeppelin Company at the Goodyear Airdock in Akron, Ohio. Construction of the Akron began in October, 1929, and she was launched and christened on August 8, 1931. The Akron relied on helium instead of the high flammable hydrogen, and this resulted in many unique design changes visible in photos of her. First, the engines themselves were housed inside the envelope of the airship, since the hot engines could not ignite the lifting gas! Moving the engines inside meant reduced air resistance adding to the Akron's top speed of 87 mph. Second, since helium was extremely valuable, rather than venting it to control altitude, each engine had giant evaporators over each engine to capture water vapor, the weight of which compensated some for the loss of weight due to burning off fuel. These evaporators are distinctive features along the sides of the envelope - 4 vertical columns over each propeller. 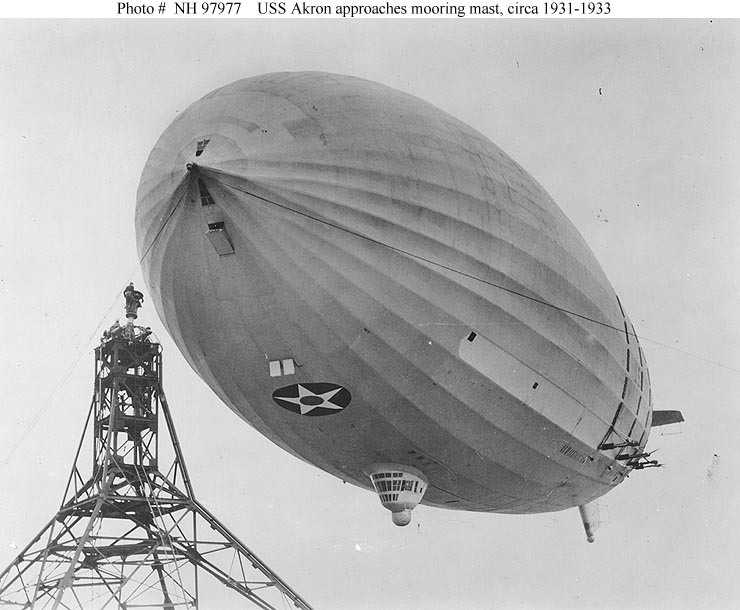 After her maiden flight and a few test flights around the Ohio, Michigan and Indiana areas, the Akron was delivered to the Navy at Lakehurst, NJ on Oct 27, 1931. In November, 1931 to the end of the year she made a series of flights for demonstration and performance information. In May, 1932, first tests of in-flight handling of the F9C Sparrowhawk, launching and capturing the small plane from its "trapeze". She made a trip to Sunnyvale, California later that month, and in the weeks on the West coast, participated in several exercises and further tests as a "flying aircraft carrier". (She carried 7 defensive machine guns!) She returned to Lakehurst in August, 1932, and resumed local operations and training flights. From January through March, 1933 she made several long distance flights including to Washington DC, Florida, Guantanamo Bay, Panama, and Balboa. She made her last flight on April 3-4, 1933. The Akron was destroyed in an unfortunate incident off the coast of New Jersey, in the early morning hours of April 4th, 1933. Seventy-three of her 76 crew and passengers perished. She served the US Navy only 18 months. The Akron encountered severe weather soon after crossing the east coast of New Jersey on an intended mission to operate along the coast of New England. Between 10 PM, April 3rd and 12:30 AM April 4th, the crew fought violent wind gusts and attempted to maintain control. Ultimately a violent gust tore away the lower rudder cables and with the Akron seriously "nose up", her tail struck the ocean and the lower fin was torn off. The Akron then rapidly broke up and sank. 73 crewmembers and passengers died. There were 3 survivors. 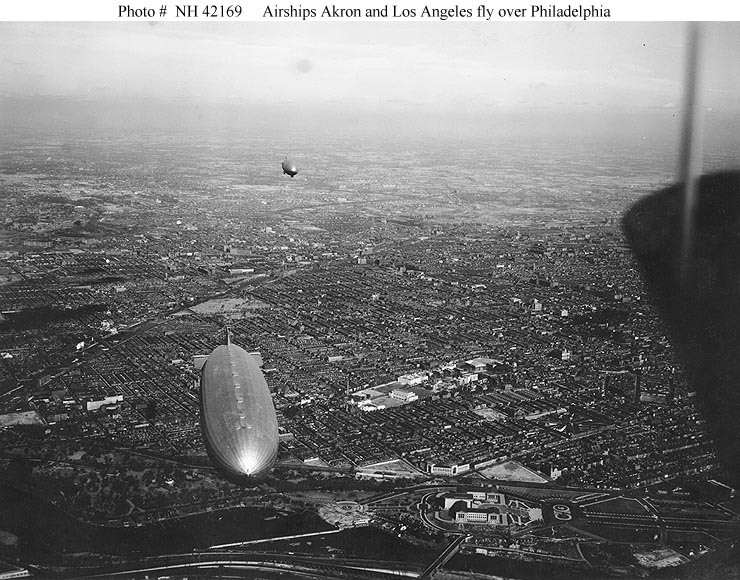 After the demise of the Akron, aside from the completion of the USS Macon, no further development of rigid airships took place in the US. Subsequent airships were of the much smaller, non-rigid design. After the demise of the Macon, the US rigid airship program ended, leaving only the German LZ-127 Graf Zeppelin, and LZ-129 Hindenburg. But the Hindenburg exploded May 1937, and the Graf Zeppelin was immediately removed from service and dismantled in March 1940. The era of the great airship thus came to an end. 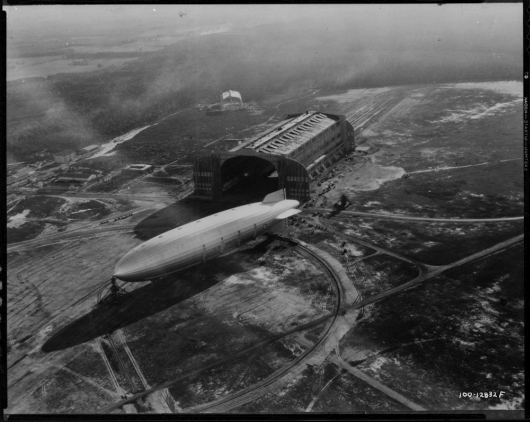 The Macon was the last rigid airship to be built in the USA. 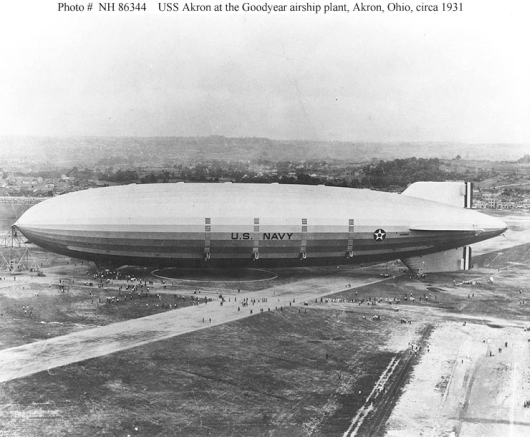 The USS Akron was built at the Goodyear-Zeppelin Company, and photos of the Akron at the site are easy to identify. 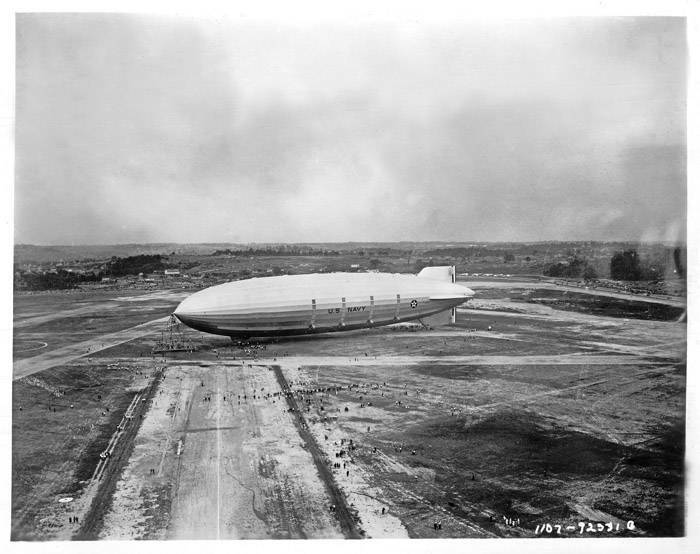 This terrific shot of the Akron at the Goodyear-Zeppelin airfield shows her moored not far from the Goodyear-Zeppelin Hangar. In fact, the photo might have been taken from the roof of the hangar as the perspective is seemingly correct. 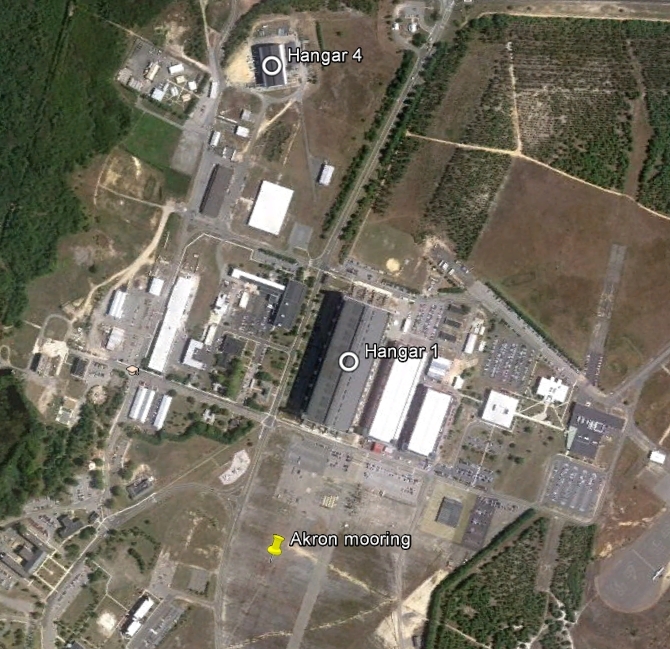 The large "strip" on the ground from the bottom left of the image out to the mooring mast is the track from the North end of the hangar. I've verified this from movie newsreels of the Akron. All those people - look like ants next to the giant airship. It must have been a sight to behold - over 2 1/2 football-fields long (785 ft), and fifteen stories tall (152 ft!). There is no way a photo can convey the magnitude one of these great airships presented to the viewer. Oh how I wish for a time machine! This photo (above) was likely taken soon after delivery of the Akron to the Navy. It is seen here moored just outside Hangar 1. Hangar 4 is visible in the background. Photo credits: Google Street View. The shot, above is at Lat 40.017873 N, 74.310421 W. (Click here to View in Google Maps). 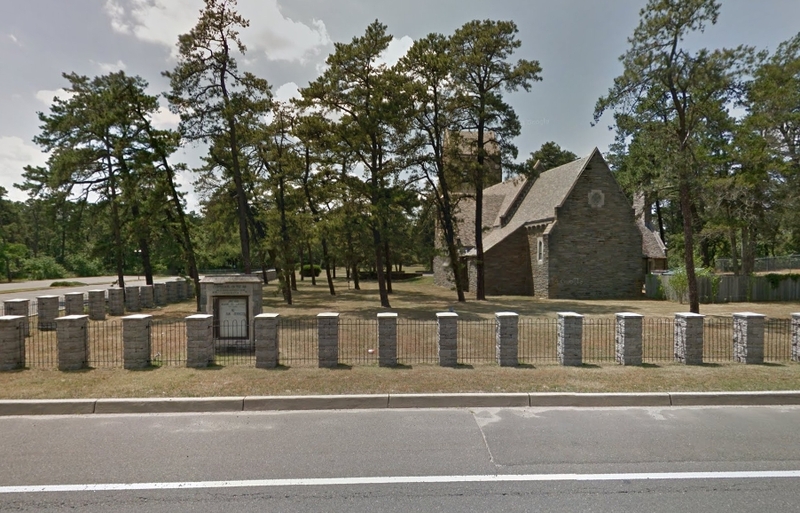 The Cathedral of the Air was built in 1932 by the American Legion to serve military personnel of the surrounding military facilities. Suprisingly, little information is found on-line about its history - even the Wikipedia article about it is only one short paragraph! 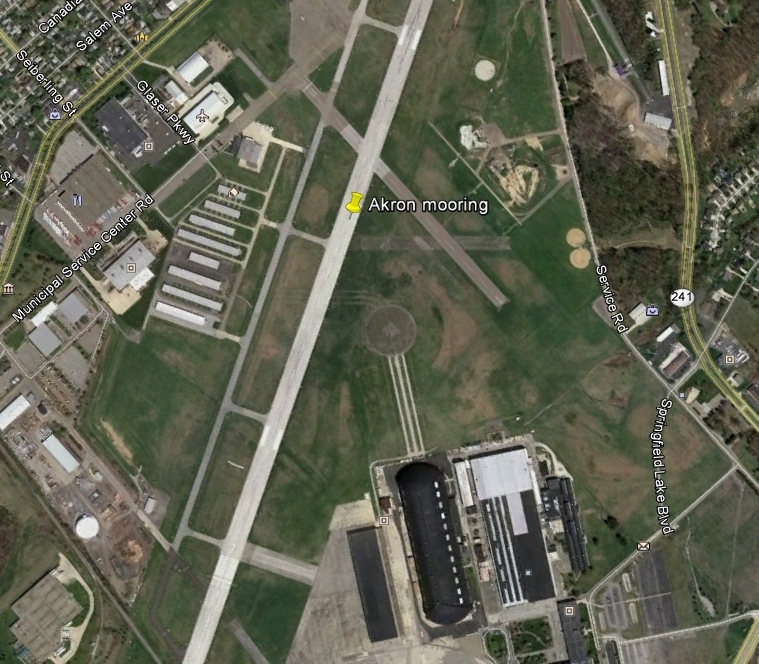 Within its walls, both the USS Akron and the USS Shenandoah are commemorated with bronze plaques. 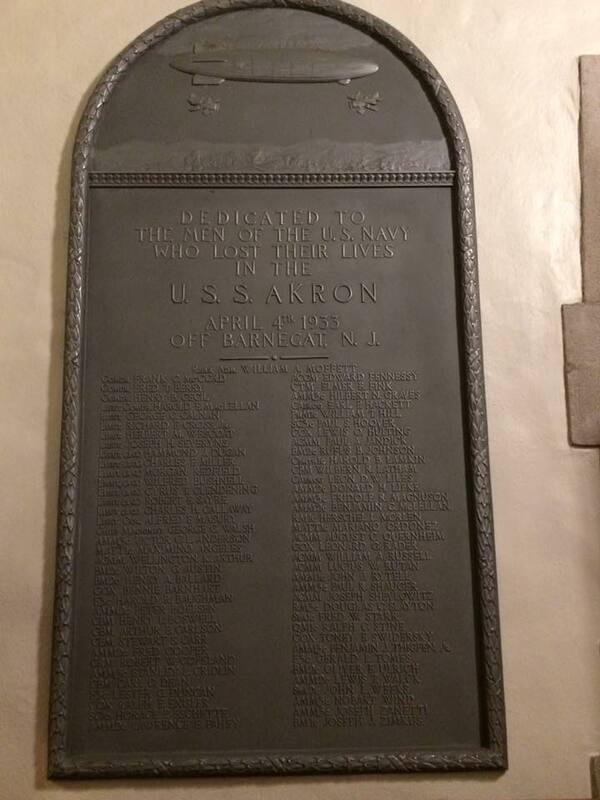 Here is the plaque commemorating the end of the USS Akron, April 4th, 1933. Note the six men marked with [*] killed in the wreck of the USS Akron who had survived the crash of USS Shenandoah in 1925! 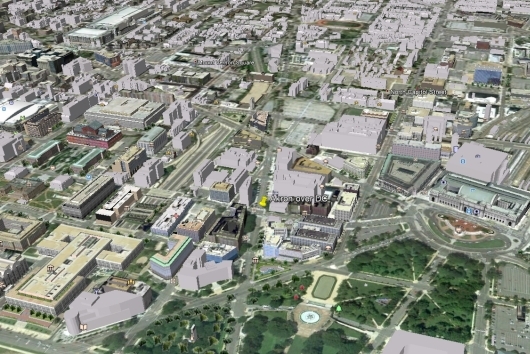 In this photo above, the Akron is low over Washington DC. The Union Station is readily identifiable at the lower right. This next photo shows the USS Akron and the USS Los Angeles over Philadelphia. 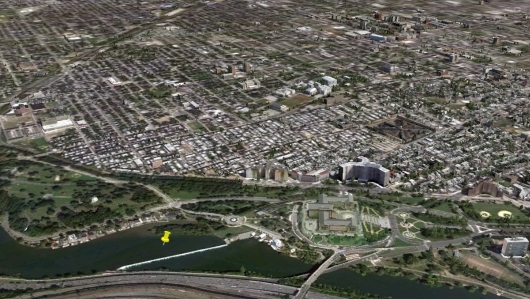 Visible in the photo is the Philadelphia Museum of Art, the Fairmount Water Works and the Eastern States Penitentiary. 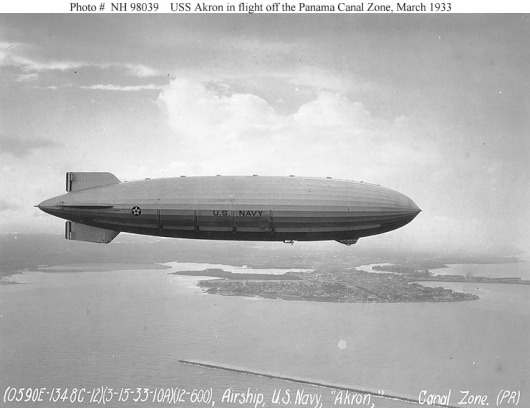 This next photo shows the USS Akron over Colon, Panama, at the North side of the Panama Canal. 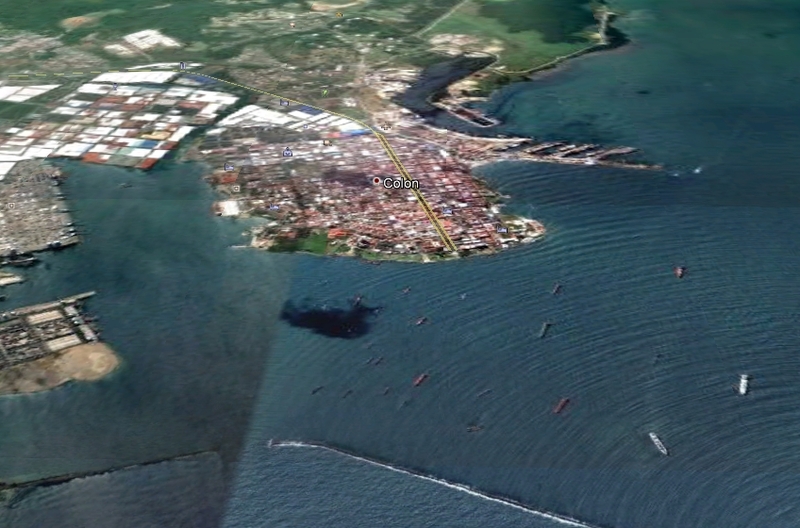 Visible in the photo is the city of Colon, Panama, its main highway "Paseo Del Centenario", and the ports of the Panama Port Company (jutting from the peninsula to the right of the city).